No, this isn’t an article about ancient prostitution. Get your mind out of the gutter. I’ve written before about my love for ancient maps. This time, I want to present you with a collection of some great resources for 3D modelling of ancient Rome, which you can experience today and see for yourself how it might have felt to walk down the streets of Ancient Rome (and therefore, to an extent, Egretia). 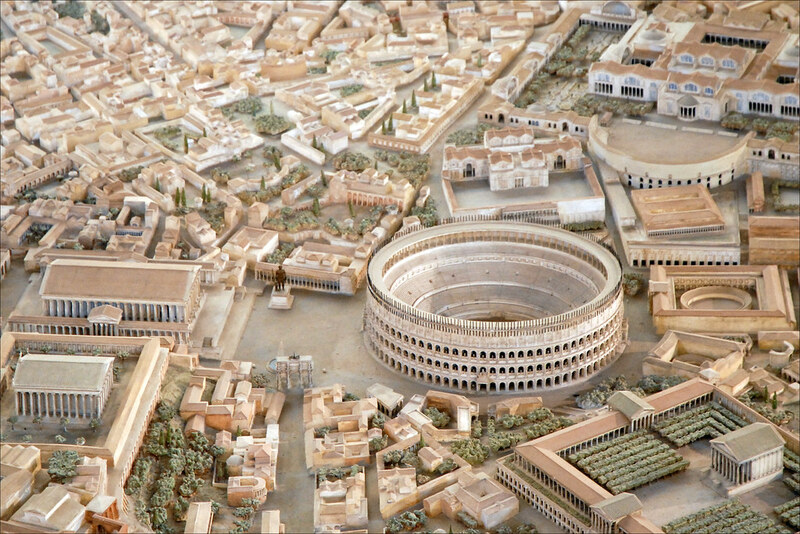 The appetiser is the model of ancient Rome known as the Gismondi Plastico (from where I’ve taken the image above). This was the work of archaeologist Italo Gismondi, that took 36 years to complete (1935 to 1971). It’s a 1:250 scale of Rome around the time of Constantine, and features Some parts of it are now known to be inaccurate (due to newer archaeological discoveries), but this is still a phenomenal thing to look at. You can find more details and images on this article, or in the model’s official home in the Museum of Roman Civilization. For the main course (pun intended), I want to direct you to the FutureLearn course of Rome: A Virtual Tour of the Ancient City. Prof Nicholls of Reading University in the UK is an ancient historian, teaching about ancient Rome. He started building a computerised model of ancient Rome based on the latest archaeological data. This model took 5 years to complete, and represents Rome’s architecture at its imperial height in the beginning of the 4th century. It is continually updated as new archaeological discoveries are made. As part of the course, Dr Nicholls shows the evidence used in modelling, and presents short videos with birds’ eye views flying over important features of the city, explaining their construction and significance. The student also gets to ‘walk’ in several sites, exploring the 3D model right in the browser to view those sites from a variety of angles. The particular course is meant for non academics, and covers what Rome might have looked like. Not just the grand monuments, but the whole city as a living, working, environment. The course format (from experience) is quite easy to consume in your free time – though you do need to allocate a handful of hours spread over the week to ensure that you keep up. If you end up lagging behind and missing the end of the course, just register again and try the next time the course is offered. For my own interests, week 4 is particularly invaluable. It centres on the daily life, the city of the ordinary citizen, rather than on the more grandiose monuments. Week 5, dealing with entertainment architecture (the Circus Maximus etc.) is helping my plan the next novel, In Victrix. In any case, if you write (or read) about ancient Rome (or ancient anywhere), this course is a must. It will make the experience much richer and more rewarding. You can also find Professor Nicholls lecture on using SketchUp, on how he built the model and how he uses it in teaching here. It offers tantalising shots of the model, with some condensed behind-the-scenes view of the model both in creating it and in justifying his decisions about each building. It excites the imagination to see how things can be experienced, and how far can modern learning methods go. I’d love to hear what you think of these resources, and any other great finds you have about Rome and history in general! Next Post: A (literally!) earth-shattering book launch! Thank you, Assaph, for sharing such interesting work! I love it. Thanks much! Just released the latest one this weekend 🙂 There will definitely will be more to come.